If you’re a great fan of Microsoft Edge browser and looking for best edge extensions which you can use to enrich the overall experience of the browser? In this article, you will read about some of the must-have Edge browser’s extension. Microsoft Edge is the default web browser of the Windows 10. This browser is much better in comparison to Internet Explorer. It is very fast and counted as one of the best modern browsers just like Chrome and Firefox. 17% longer than PC running Opera browser. The edge browser can provide you longer browsing time and save the battery life of your Laptop/Tablet. In the beginning, Edge browser does not support extensions. But in Anniversary update of Windows 10, the company added the ability to use the extension in the Edge browser. Currently, it lacks some of the best browser extension, but we assume that soon this browser will have some great extension. By keeping this thing in mind, we decided to gather some of the best Edge Extensions from the Windows Store to show you which one we consider. 2. Click (…) More Action Icon and navigate to Extensions. 3. After that click “Get Extensions from the Store” link. It will launch the Store app with all the extensions available for Edge browser. 4. From the list, click on the extension which you want to install on the browser. 5. Download the extension click on “Free” button. 6. Once done, you will get the notification from the browser that you have installed the new extension with a little pop-up. 7. If you want to manage the extension or uninstall it, click on the gear icon on the side of the extension. 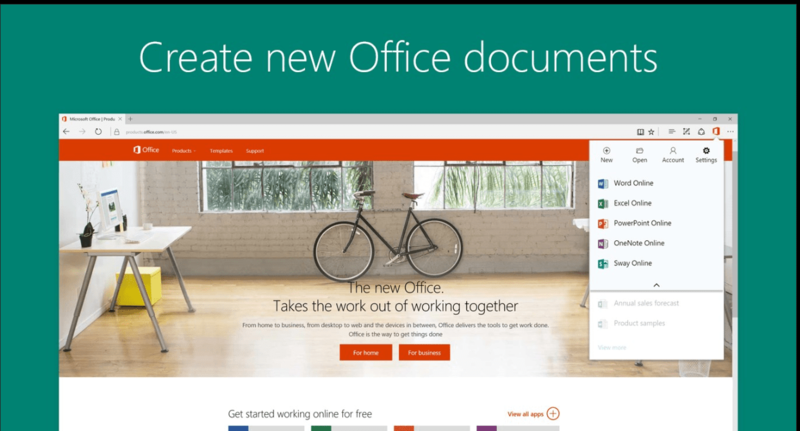 Office Online is the official extension of Microsoft Office Online using which you can view, edit, and even office files right from the Edge browser. You can get access to your office files, no matter whether you have stored them offline or online. With this extension, you get features of Powerpoint, Excel, Word, OneNote, and Sway. LastPass is one of the best and free password manager available on the internet and this is its official extension for Edge browser. With the help of this extension, you can save your password. It also helps you in providing secure access from every mobile device and computer. Adblock is the official extension of one of the most popular ad blocker service. With the help of this extension, you can block ads on YouTube, Facebook or anywhere on the web. The good thing about this extension is that work automatically. You just need to install it and visit your favorite and see the ads disappear. But, remember installing Adblock will block every ad on the web and you will miss some decent offers and deals, Adblock is also killing the free web ad 90% websites depends on Ads to make money. But, remember installing Adblock will block every ad on the web and you will miss some decent offers and deals, Adblock is also killing the free web as 90% websites depends on Ads to make money. You can whitelist this website to support us, as we don’t put any annoying or pop-up ads. It is the official extension of the Evernote. With the help of this extension, you can save all your favorite things you see on the web to Evernote account. Once it is saved you can access it from any device. You can also highlight the main title of the web page before sharing. Amazon Assist helps you in making a right decision while shopping online. It provides you the deal of the day, order notification, product comparison, universal wish list, and shortcuts to save your time. This extension is dedicated to all the people who loves to do shopping on Amazon. With this translator extension for Edge browser you can translate web pages of foreign languages. To use this extension, first, you need to visit the foreign language web page and click on the translator icon in the address bar to translate the whole page into your preferred language. The good thing about this extension is that you can also translate particular text on the page. For that, you need to select the text and make a right click to translate into your desired language. Reddit Enhancement Suite is one of the decent edge extensions dedicated to Reddit users. It helps you in exploring the site more easily with little option to enhance the site the way you want. It is unofficial client extension and is not associated with Reddit in any way. Mouse Gesture is the one of the best extension available for Edge browser available in the Windows Store. With the help of this extension, you can perform basic browsing with the help of gesture. To take advantage of this extension, you need to make a right click and then gesturing with the mouse. For Example, you need to go back to a previous web page, then just move the mouse right to left. With the help of Pocket Extension for Edge browser, you can save new stories, articles, and videos which you want to read or watch them later to your pocket account. Just with one click, you can save any web page. It provides you very easy to read and clean layout for distraction-free reading. Just log into your Pocket account and start reading your favorite articles anytime on any device. This is official Edge browser extension for Pinterest. Using this extension, you can save creative ideas from the web to your Pinterest account. You can pin your favorite food recipes, articles which you want to read later and much more. These are some of the edge extensions which you must install on you Edge browser to enrich the working experience. Why don’t you give a try to these extensions? Also, let us know your favorite extension for Microsoft Edge browser.